A handwritten note on the back claims that the painting once bore a label indicating that it was displayed in “the Copley exhibition” in Boston in 1902. However, this is very unlikely, as the painting is not of exhibition quality and the Copley exhibit of 1902 was devoted solely to paintings of attractive women. The catalogue for that exhibit makes no mention of William Trego. The painting is done in a very sketchy fashion and may be a work Trego did quickly on a request from a cousin. 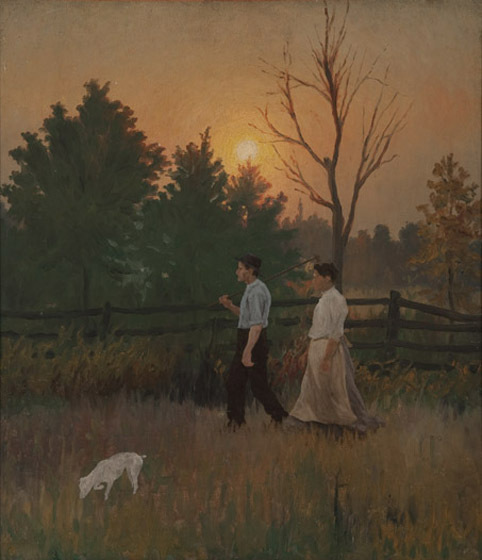 The couple are identical in pose and position to figures in a black-and-white oil painting Trego apparently did around that same time as an illustration. However, while the figures in the illustration painting are quite detailed, the figures in this painting are notably without details, lacking even facial features. Obtained from the artist by a member of his cousin Howard Trego’s family, it has been passed down in the family ever since. The current owner is a great-grandchild of Howard Trego. The painting is in fair condition.